Cyber Monday has been good to eBay. Shares of the auction site hit a 52-week high Thursday, just days after logging strong gains on one of the most important online shopping days of the year for retailers. It's not just online shopping that's attracting consumer interest. All in all, it looks like consumers are increasingly getting more comfortable with paying for their purchases on mobile devices. eBay (EBAY) also got a boost from PayPal, which saw a 190% year-over-year increase in global mobile payment volume on Cyber Monday. PayPal, which is owned by eBay, also said its Cyber Monday payment volume trumped Black Friday by 44%. 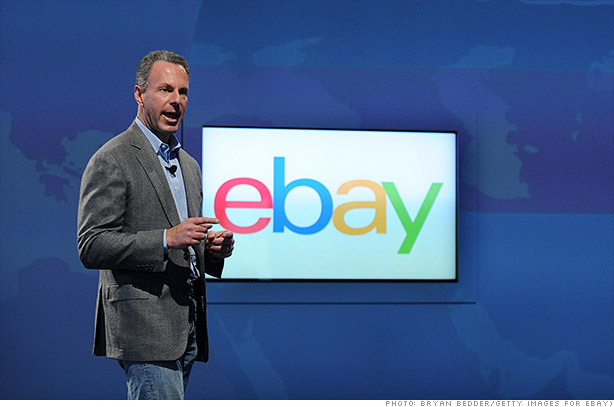 All of that combined is good news for eBay. And StockTwits traders seem to agree. But it's not just eBay that's faring well. Even with the possibility of massive tax hikes looming, investors have found an appetite for a hodgepodge of select stocks. It's that time of year, when people are looking up gifts on Google (GOOG) or shopping for last minute travel deals on Priceline (PCLN). And let's not forget, if you're shopping online, you're probably using a credit card. That would explain the boost for Visa (V) and MasterCard (MA), which also both hit new highs today. Back to eBay. It also recently got a big lift from Hostess' bankruptcy, when there was a run on Twinkies. I'm not sure I can say that's good for the economy per se, but it certainly keeps eBay relevant. Let's be honest, it has a pretty good reputation, is easy to use and has been around long enough to have gained consumer trust.